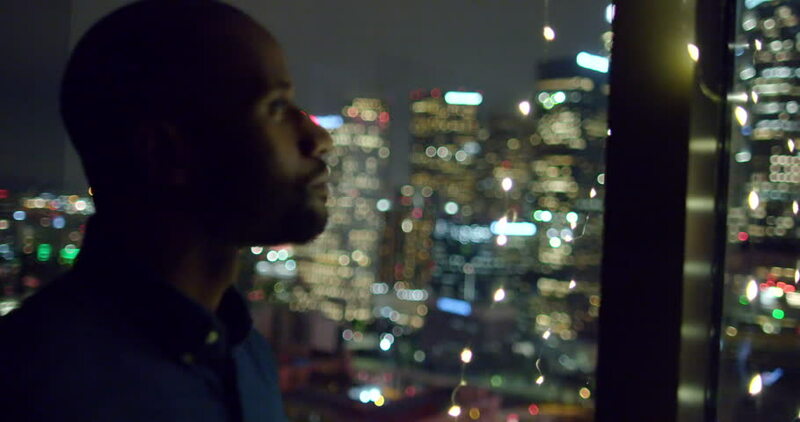 Dark skinned African American man sips from a wine glass in a window with city lights while looking out at Downtown Los Angeles at night. Medium close up, hand held. hd00:12Young Couple Boy and Girl Celebrating New Year With Champagne and Sparklers. Fit and Smiling, Happy. 4k00:10Businessman on the Roof is Looking at Night City. Shot on RED Cinema Camera in 4K (UHD). Its easy scale, rotate and crop without loosing quality. 4k00:29Frustrated man using mobile phone at night. Bokeh background. 4k00:21Woman reading something on tablet and drinking tea. Sit on the windowsill in the dark at night. 4k00:21Handsome African American man stands in profile laughing and drinking coffee in front of Downtown Los Angeles skyline. Medium close up, recorded hand-held in slow motion at 60fps.